the light-flooded main room has a dining area seating four and an inviting sectional facing the flat screen cable TV. The fully equipped kitchen area has a stove,oven,microwave,refrigerator, and coffee maker with cookware and utensils. The bright bedroom has a comfortable, spacious king size bed and also access to the balcony. The bathroom come with a lot of natural stone and a roomy walk-in shower. The common area includes rooftop terrace, the bar with friendly staff and of course the roof-top pool. There is also a small fitness center and a kid´s area. The apartment is on the 4th floor and provides you with a beautiful view of the village and the ocean in the back. the 5th Avenue with lots of bars, restaurants and shops is just a short 5 minute walk away from the apartment. For all your daily needs there is also a big supermarket even closer than that. Sorry no pets allowed. Best location for walking at the 5th Avenue where you can find all shopping, bars and restaurants in town. 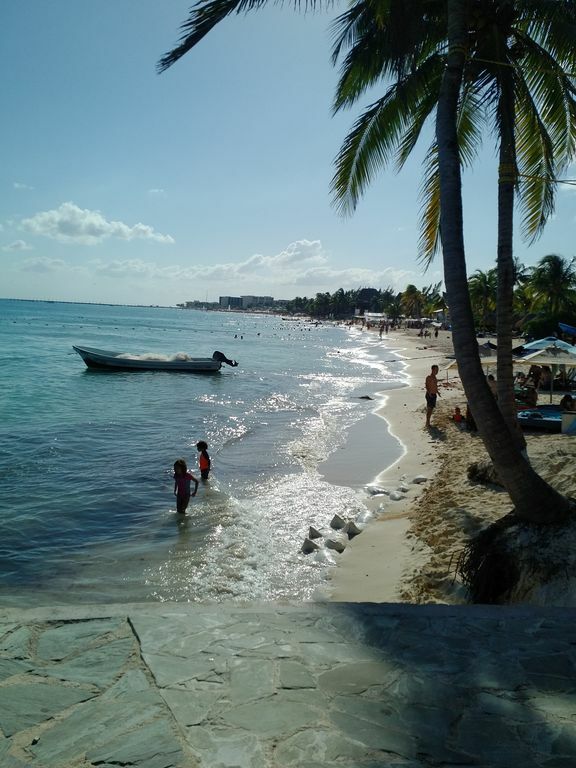 Staying at Maggie's property was lots of fun, the location was great, the unit was fresh and new, the staff was helpful and the overall atmosphere in Playa del Carmen was refreshing. Thanks for your hospitality, Maggie. We spent 2 weeks at Maggie's condo and loved it! The location was excellent...1 block to grocery, 3 blocks to 5th Ave, and 4 blocks to beach. We used the rooftop pool which had a great city and ocean view. The rooftop bar served great drinks. Front desk staff were friendly and helpful. The condo itself looks new and is very clean. The bed was comfortable. The kitchen had everything we needed to cook meals although there are lots of great dining options within walking distance. Maggie was very helpful and accomodating. Can't wait to come back! I would recommend this place to any couple going to Playa. Clean, safe, very friendly & helpful people working the front desk. The roof top pool had a beautiful view of the ocean and the overall location was perfect, not too close but not too far from the main drag. Very clean and modern. The location is great for everything we needed! The property is very nice and well kept. Has a nice roof top pool and a nice sitting area below. Bus station a block away and so is grocery. The staff here are very helpful also. Maggie is always there if you need anything. We highly recommend staying here. We had a wonderful stay at this bright, clean, modern apartment. The suite is on the fifth floor and faces east where the ocean, and on clear days, the island of Cozumel are visible. There is a large supermarket one block to the west and the restaurants on 5th and 10th are just a couple of blocks away. The beach is close by, about a 10 minute walk, but we found the roof-top pool with its views in three directions was spectacular for lounging in the sun. We loved our evening margaritas and uniquely blended mojitos at the bar just down the hall! The unit was clean, quiet and well-supplied with everything we needed to relax and enjoy our stay. Thank you, Maggie, for your warm welcome and helpful arrangements! This is the type of apartment you would expect to see in Sweden because everything is from Ikea. But it is very nice and the location is ideal. Its four blocks from the mayhem on 5th avenue and one block from the Ado bus station. The deck is small but the outdoor bar and pool are next door and convenient. Maggie is very responsive and kind. I would book this again the next time I go to Playa.